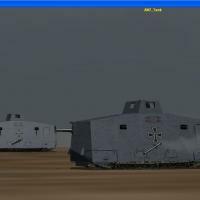 You will have the chance to operate either a British Mk V Male Landship or a German A7V Panzerkampfvagen Assault Tank. Against another tank force. The mission file included a new script file be sure to place both the scripts folder and the situations folder into the main Canvas Knights Folder...Then away you go tanking across No Man's Land.